and how to buy one. PT Watercraft PT Eleven, 11ft Nesting Dinghy is unique, efficient, functional, modern & attractive. The PTW on each page will bring you back to the Welcome page. Central links are at the top and bottom of each page. The Bird Insignia will take you back to the PT11 Homepage. Kits from Port Townsend Watercraft are cut by our local CNC shop, Turn Point Design. They use both a 5 axis and a 3 axis computer driven router. We have really taken advantage of the kit technology using tongues and slots, scribe marks and alignment notches. There are 7 hull panels that are put together without any sort of jig (except for the bulkheads and machined gunwales). 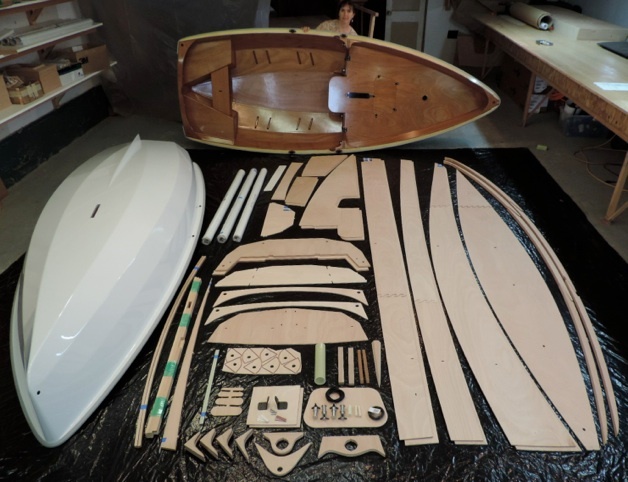 Our kits are machined from 5 different thicknesses of plywood, to both make the boat as light as it can be for its strength and make building it easier. Our goal from the beginning has been to make this rather sophisticated little boat as easy as possible for anyone to build. To that end, we have written a very detailed, instructional manual that includes hundreds of photos. * “cash based” payments receive a 2% discount. Shipping is with UPS Ground for the USA. You can request a different carrier. Sailing Rig is packed separately in a cardboard tube, 96”x7”x7” @ 17#. What does the base kit include? 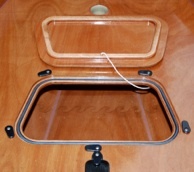 -Daggerboard trunk kit; includes plywood walls + pre-fiberglassed trunk logs + 1/32” - G-10 strip for trunk edges. Note: From the above list, the Lloyds approved, BS1088, Okoume marine plywood comes from France (Via Gabon) and is imported by Edensaw Wood, is our local supplier. When we cannot get Joubert, we buy Bruynzeel, made in Holland. We do not use Chinese plywood. Everything else is Made in the USA. This manual is 280+pages, mostly in photographs, with instructional text designed to teach the fine art of building with plywood & epoxy efficiently, while building the PT Eleven nesting dinghy. Prospective builders can buy the manual only and be credited the manual price upon purchase of a kit. 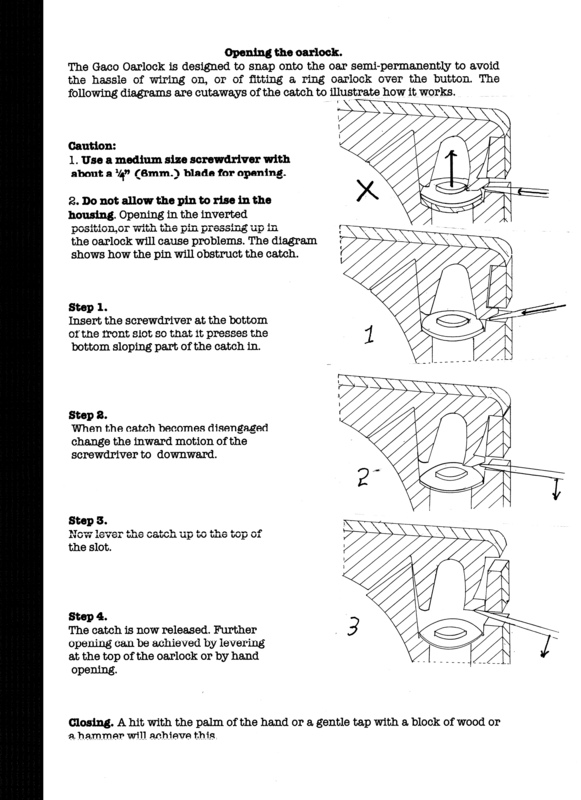 See the manual introduction here. #Materials used in our kits. We recommend West System Epoxy as being the best choice for this light-weight wood epoxy construction. We offer epoxy kits from WEST SYSTEM. Epoxy Basics e-book by Russell Brown Now available HERE. We cut kits exclusively from Lloyds approved BS1088 Okoume Marine Plywood. 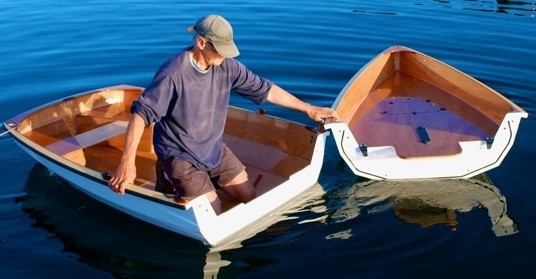 Okoume marine plywood has become a favorite for this type of boat building. do not buy Chinese plywood. 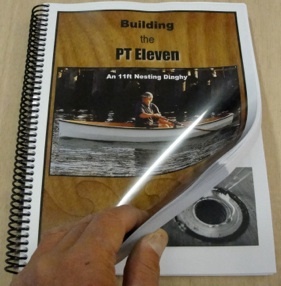 ✓ Three different weights of fiberglass cloth is needed for the PT Eleven and is included with the kit. The 8.9oz cloth, Hexell #7725, was developed for composite aircraft construction and has excellent properties. The 4oz & 6oz cloth is especially finished (F81) for use with epoxy as opposed to polyester resin. A local machinist sources high grade stainless steel stock for our connective hardware. The hardware is machined in small batches with emphasis on accuracy. They are beautiful parts designed specifically for this boat. We do not sell them individually for other projects. We cannot be sure they will work on another design as the alignment system is also critical. Our alignment Clips are molded carbon fiber. Russell makes these parts in batches in our shop. Our sailing rig mast and boom are also made from carbon tubes, custom made by Innovative Composites in White Salmon WA. Russell also makes the fiberglass tubes used as mast steps. Other epoxy, G10, & Delrin parts are made or machined locally from stock we purchase from McMaster Carr. There is a great deal of hand work that goes into creating many little essential parts included in your kit. 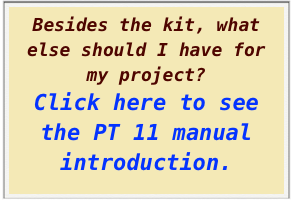 PLANS for the PT 11? No. We do not have plans for the PT 11. There would certainly be some advantage to have plans. However, our boats don't lend themselves easily to being built from plans. Our kits are designed in CAD from the ground up as KIT BOATS. We have really taken advantage of the kit technology using tongues and slots, scribe marks and alignment notches. Modern kit technology also allows for a high degree of consistency with the finished product and we sleep better knowing that we have done everything we can to insure you are getting a boat as described. There are 7 hull panels that are put together without any sort of jig (using for the bulkheads and machined gunwales to lock in the shape). If the panels are not super accurate, then the bulkheads would not fit. The slightest inaccuracy over length would also lead to a wonky hull shape. 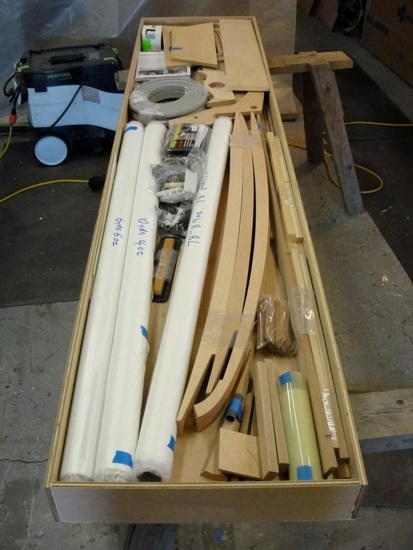 Our kits are machined from 5 different thicknesses of ply wood, to both make the boat as light as it can be for its strength and make building it easier. To build from plans, with our standard of quality as provided in the kit, would cost the builder more in the end both in time and materials. Our goal from the beginning has been to make this rather sophisticated little boat as easy as possible for anyone to build. To that end, we have written a very detailed, instructional manual that includes hundreds of photos. The daunting task of writing a manual specific to, and adequate for, building from plans is one we cannot consider right now. Will you ever have plans? We hope to one day design a simpler boat that could be built from plans but it would be a compromise. Information from builders remains scant and varied. Everyone seems to be having too much fun to keep track.. ;) . One builder logged app. 190-220 hours including repairing some mistakes, while another said he took closer to 300hours. It makes sense that everyone has a different work style and pace and perhaps these numbers are a fair guide. Ocean freight is actually not bad. It is the port and clearance fees (+fumigation in AU) that are the bummer. Shipments of 3 or more kits can make up the minimum LCL of 1 cubic meter and really spreads out the port and clearance costs. So think group orders addressed to a commercial entity if you can. Find out what the import costs are in your country. The more questions you ask locally, the fewer surprises. AIR FRIGHT has become a viable option as I continue to work with shipping agents but again, import duties are the most important to find out. Canada: 12% - 13% HST. If you are in the USA for 48 hours, there an exemption on $800 value per person. Contact me for more information. Perhaps you would like to tour the Olympic Peninsula! (this information was accurate as of 01/01/15) Also see KINEK.COM. At some point we may establish distributors/licensed producers in Europe and Australia but the logistics are confounding. 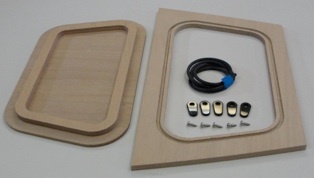 Our kits contain so many specialty parts that locally cutting the 6mm plywood parts still leaves a large part of the kit to export. Best is to Contact me for a quote. PT Watercraft offers kits for new and unique boat designs that are efficient, functional, modern & attractive. "I have started and I love it! What an amazing design, kit and manual. I think I told you I did a bit of ply epoxy work, but this is honing my skills to a next level. …." 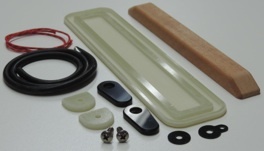 Low profile Daggerboard Trunk Cap kit: includes the machined G-10 cap with gasket and stiffener notches, mahogany cap stiffener (this also locates the cap), the gasket, 2 riser pads, 2 turn dogs, tether, washer & tether washer, & fasteners. The finished and installed hatch. Water tight hatch kit for the PT11 foredeck or the aft seat on the PT Spear: On the left is the hatch lid and lid doubler. On the right is the hatch coaming with gasket notch, 42” gasket, 5 machined Delrin(R) turn dogs and fasteners. Leather Pads: These pads offer chafe resistance at key positions where the hull halves touch when nested. Center alignment marks are scored into four laser cut pads. The nested boat halves have contact with each other in 4 places. 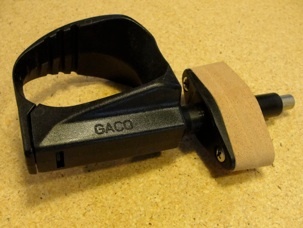 GACO (TM) gated oarlocks: Without riser blocks: Gaco Oar locks (Includes 1 pair of oarlocks, 4 sockets & fasteners, riser blocks purchased separately. See above.) Click to see the GACO video. 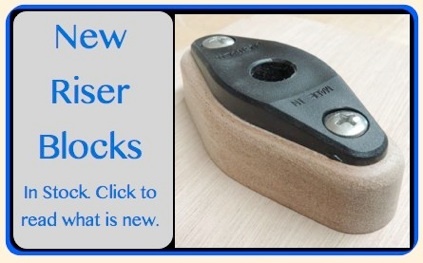 Mahogany riser blocks: 4 machined, radiused and drilled mahogany riser blocks with fasteners. The risers give the oarlock socket more bearing and provide a good rowing height based on the industry standard, and, without interfering with the nested package height. We recommend this oarlock also because the shaft diameter is smaller than traditional oarlocks.